The Smithsonian's Cooper-Hewitt National Design Museum, in the Extreme Textiles exhibit. Showing April 9 through October 30, 2005. Nylon, polyester and advanced polymeric fibers such as Spectra and Kevlar can be combined with integrated conductive fibers to transform conventional rope applications. Conductive fibers are braided with traditional fibers to produce a rope that is capable both of carrying a load and monitoring the weight of that load. Squid Labs is developing this technology to provide load, abrasion and localised wear information to assist rope users in assuring the quality and reliability of their ropes while in service. We envision that intelligent, self-monitoring ropes such as these may be used everywhere from mooring huge ships at anchor to the hands of rock climbers indicating when the ropes have been damaged by abrasion or overstrained by a fall. These ropes may be used for safety applications such as seat-belts, lifting ropes and slings; architectural applications such as membrane structures and tents; naval applications such as towing lines, mooring lines and automated sheeting of sails; and for recreational applications on small boats and yachts, on kites and for mountaineering. The rope acts as its own strain gauge, monitoring tension constantly while the rope is in use. 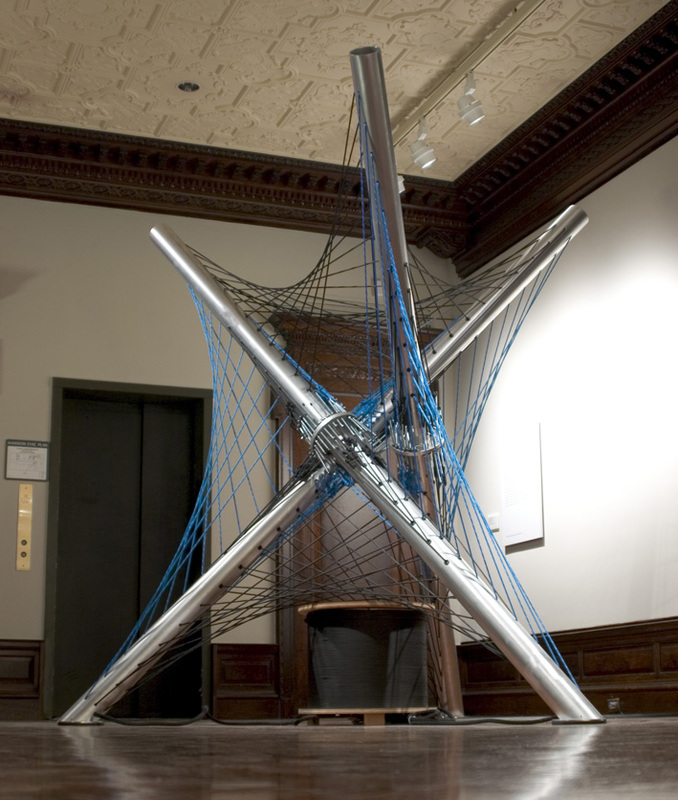 In this installation, changing the tension in the blue active ropes creates an electrical signal that modulates the music that you hear through a synthesizer. Just as the human muscular-skeletal system is a tensegrity of muscle and bone, the ropes and aluminum tubes form a tensegrity of tension and compression, pushing and pulling, weightlessness and gravity. three main struts are 12.5 feet long, 5.5 inch diameter. Based on the Tensegrity structures of Buckminster Fuller. The three main struts are held in place only by the tension of the ropes, they are not attached to each other or to the floor. 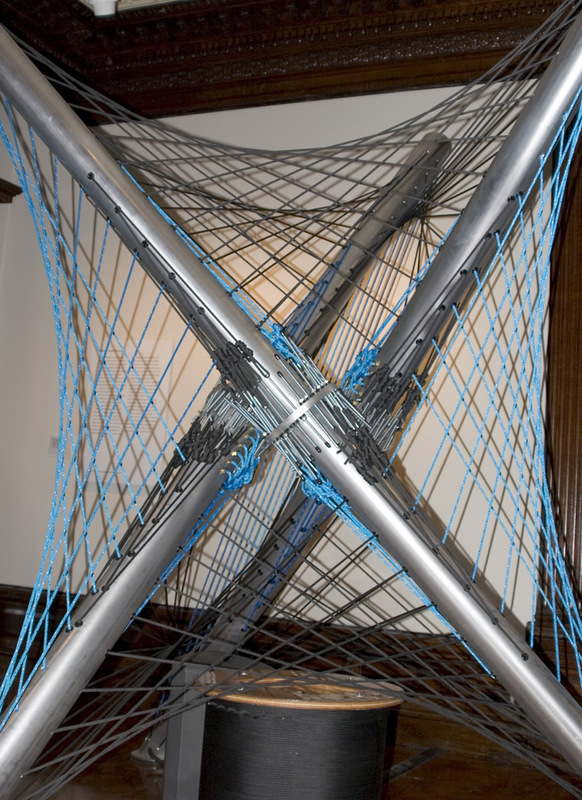 A "standard" three-strut tensegrity of similar form has nine ropes required to hold it up. Here we have replaced each of those nine ropes with a spline of twelve, resulting in 108 total ropes. The resulting structure is surprisingly sturdy, it can easily support hundreds of pounds from the top end of each main strut with negligible deformation. This makes sense once you consider that the tension on each of the 108 ropes is between 50 and 150 pounds. Blue ropes (36) - structural and sensing. These showcase our Electronic Sensing Rope technology. Pulling on a blue rope causes an elastic deformation of the rope which modulates its electrical properties. 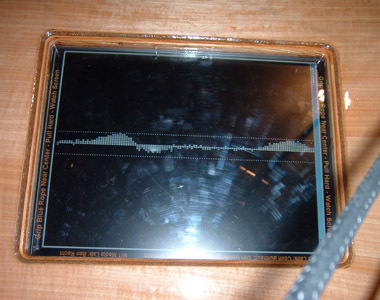 The change in electrical properties is detected by a computer, which plays a different synthesized sound for each rope. Electronics - All electronics are in a custom enclosure shaped like a large spool of rope, which sits under the main structure. Display - central computer display screen shows the activity on all ropes (see screen shots below). 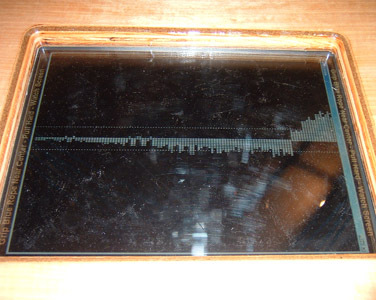 The display shows some of the data sensed from the ropes, giving a finer grain of visual feedback than the sounds provide. The display has dotted lines showing how much pull is needed to make a sound, helping to correlate visual and audio stimuli. Blue ropes - Custom developed by Squid Labs. Construction somewhat similar to the black ropes, but with a special active core. The sheath is a standard blue polyester. The active core is composed from a mix of polyester and discontinuous stainless steel fibers. It is not tuned like a guitar. The sounds you hear are synthesized, they are not based on the vibration frequency of the rope like a normal stringed instrument. When the rope is pulled more than a certain amount, the computer plays a sound specific to the rope which was pulled. Pulling harder won't change the sound like with a guitar, on the other hand it never goes out of tune and it can make some very fun sounds - any sound we want really. What are the sounds it is making? There are three sets of twelve blue ropes. One set sounds like bells or wind chimes. The 2nd set sounds like a dulcimer or xylophone. The 3rd set has a variety of fun percussion sounds. What is inside the three metal struts? Just a lot of knots and wires, and lead weights at the base. There are no sensors or electronics or pickups. The rope is the sensor. How do the metal struts not tip over? That is the magic of the tensegrity structure. It looks like it should just fall down, but in reality it is incredibly strong and stable. Each rope is pulling in a different direction on the struts, so no matter what direction you try to pull or tip a strut, there is a rope holding it in place. What is inside the rope spool? a computer with data acquisition board, a power supply, a fan, a monitor, a custom circuit board with signal filters, a power strip, a lot of wires and connectors.